Speed is very important on the first beat because your competitors are all so close together. By going fast, you can get your nose in front of the boats around you, and this will give you clear air plus a chance to play the shifts. When you come off the starting line, you must settle quickly into a speed groove. Try not to get distracted by the boats nearby, and look for the sail trim and feel you had during your pre-start tune-up. Also, try to set a good tone for the rest of the race by focusing on speed, working hard to go fast and communicating with your crew. Here are some more tips. Should you sail higher and slower or lower and faster? When you’re trying to find a fast goove upwind, you have a wide range of headings and speeds from which to choose. How do you find your target boatspeed? On bigger boats with instruments, you often have charts of the speeds you should aim for in each wind velocity. On other boats, you have to go simply by feel or, better yet, by judging your relative performance versus nearby boats. Keep your air clear. Most fleets are packed pretty close together off the line, so having clean air can be a huge advantage. In fact, it’s probably better to be slow with clean air than fast with dirty air. Therefore, do not sail in bad air unless it’s absolutely necessary. This is especially critical in lighter air where wind shadows are real killers. Look ahead to find lanes of clear air, and do everything you can to stay in them. Sail fast in bad air. Occasionally you must “live” in bad air temporarily for tactical or strategic reasons. When this is a necessity, shift gears so you keep going fast. Sailing in another boat’s wind shadow is a little like getting a lull in wind velocity. You usually need to add power to your sailplan, move your crew weight in and forward, bear off a few degrees and so on. Copy the other boats. Your competitors are a great source of go-fast ideas, so keep an eye on them, especially early in a race or series (when you see them for the first time and you should be open to ideas about going faster). Look at the shape of their sails (e.g. fullness, draft position, twist) and the attitude of their hull compared to yours. Pay particular attention to boats that are going faster than you, and don’t be afraid to copy their set-up. Use other boats as a gauge. In order to optimize your performance, you must always know whether you are going fast or not. And the only way to really judge your speed at any particular moment is by comparing yourself to nearby boats. So make sure someone in your crew keeps an eye on other boats. Are you pointing as high and going as fast through the water? If not, try changing the trim of your sails or hull and see if it makes a difference. Keep experimenting like this to improve your speed. Use reference marks. The ability to reproduce fast trim settings from race to race and day to day is very important. Therefore, I recommend using reference marks or scales on controls such as your jib leads, halyard tension, outhaul, cunningham and mast position. It’s better to have too many marks, since a few extra ones won’t hurt (and they may help). Also, a mark on your sheets can be a great reference point for getting to a particular setting quickly (e.g. after a tack) or for fine-tuning your trim. Try a “wider groove.” It’s not easy to go fast 100% of the time, but you should try to stay in the groove for as much of each leg as possible. One way to do this is by setting up your sails so you have a wider groove. 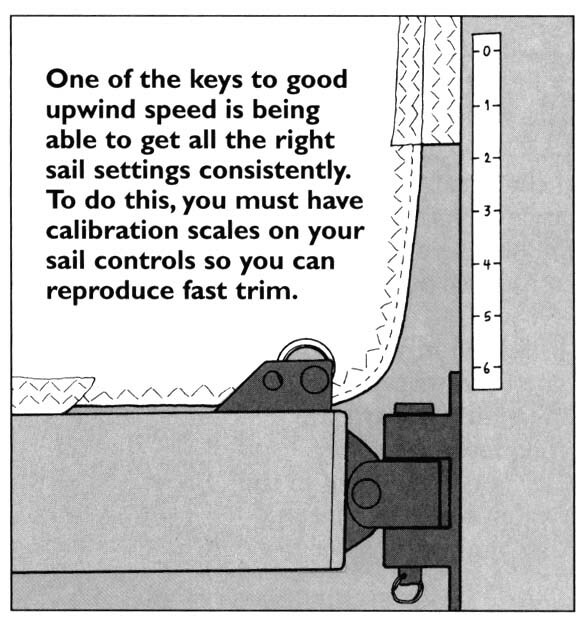 For example, give your sails a little extra fullness, move their draft forward, and don’t try to point quite so high. By doing this you’ll give up a little bit of high-end performance, but you should also have fewer times when you stall out and go very slowly. You’ll be fast more of the time and improve your overall average speed (especially when you have waves or other conditions that make it hard to stay in the groove). Shift gears constantly. Sailing conditions are always changing, and this means you must continually adjust the trim of your sails and hull in order to keep going as fast as possible. There’s almost nothing slower than leaving your sheets cleated when you get a change in wind or waves. It’s especially critical to change gears, if necessary, right after the start. With the boats so close together, you need every inch you can get. Plus, as you come off the line, the conditions may be different than they were the last time you sailed upwind before the start. Work on communication. If you want to shift gears smoothly and keep going fast, you need good communication among your crew. Every member of your team can and should contribute to speed, and communicating with other crewmembers is usually helpful in doing this. Contributions include information about wind and waves that are coming, your speed relative to other boats, thoughts on sail trim and so on. When I’m driving I’d rather hear too much info than not enough, but you should talk with your crew about the desired level of chatter. Execute good tacks. On the first beat, tacking is an integral part of your overall speed equation. If you lose three feet on every tack, you will soon be in the second row with bad air and fewer tactical options. So work hard on tacking technique in practice. Once you start the race, make every tack count. Remember, you may need only a foot or two to cross the next starboard tacker. And that could mean the difference between going the right way with clear air or not. Watch for bad air and waves. When you are approaching or leaving a mark, you will often find disturbed water or wind that could hurt your speed. At the start, for example, the water is often extra bumpy because lots of boats have been sailing in circles for quite a while. At the windward mark, you may find a wall of bad air from boats sailing down the first reach. To keep going fast, you should adjust your set-up to compensate for these conditions. Typically you need to add some power to punch through the extra chop or bad air. Get rid of water and weeds. There are some things you never want when sailing upwind, and these include weeds on your foils or water in your bilge. Therefore, be sure to bail out your boat and do a weed check a few minutes before your start. Then keep your boat weed-free and dry all the way up the first beat. If you have through-hull bailers and you aren’t using them, close them to minimize drag. Use weight and sails to steer. Every time you turn your rudder you creat drag, which is slow. So minimize rudder movement by using crew weight position and sail trim to turn the boat. For example, if you want to head up, trim your mainsheet a little and heel the boat slightly farther to leeward. If you do this every time you turn the boat, you could gain boatlengths over the course of the first beat. Figure out your targets. If you sail a bigger boat with instruments, you should probably be using “target” speeds to optimize your performance upwind. These speeds, which are different for every wind velocity, are determined by computer or by trial and error. The problem is that you never know exactly which target speed to aim for until you sail against other boats. 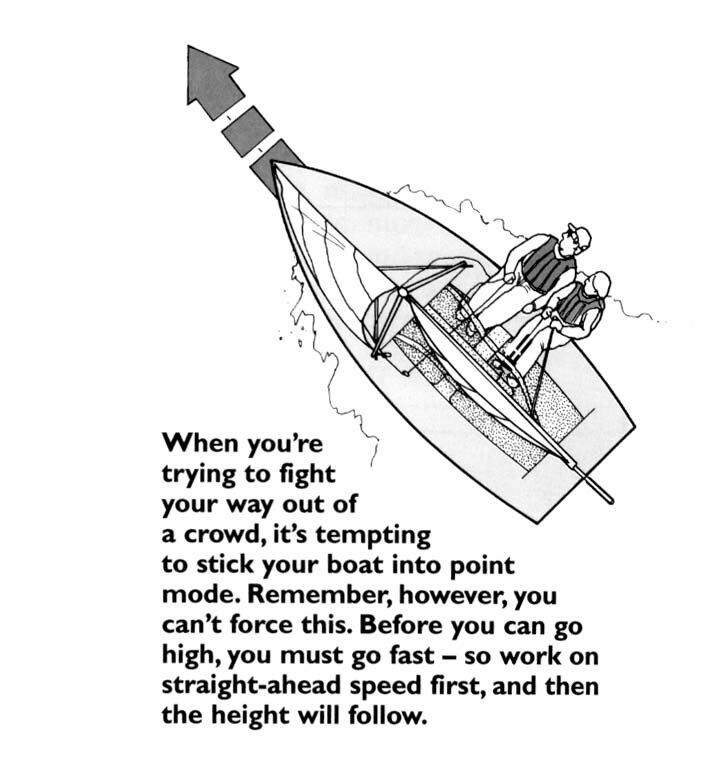 So as soon as you start racing up the first beat, watch your speed versus other boats. 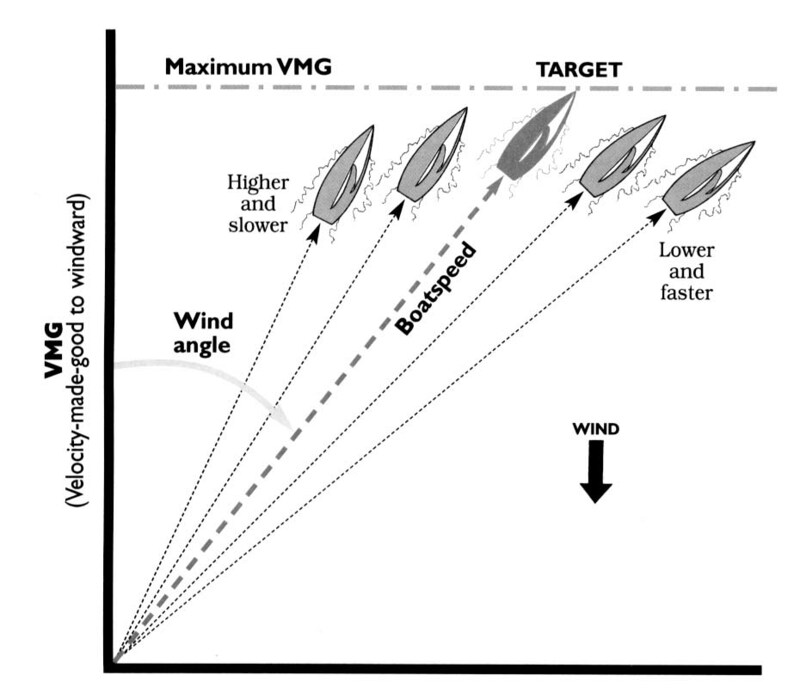 Make sure you are sailing the speed that will give you the best VMG upwind. Concentrate and work hard. Above all else, speed comes from an attitude and a desire to go fast. To get your boat in the groove and keep it there, you must concentrate on speed for long periods of time. This is hard work, but it will certainly make a difference in your position at the windward mark. Dave is a two-time America’s Cup veteran who publishes the newsletter Speed & Smarts. For a subscription call: 800-356-2200.